Public Private Partnerships are one of the tools governments use to tackle bigger projects and investments, often large – and challenging – infrastructure such as roads, bridges and airports. These projects last decades, not years and have to deal with many risks throughout their lifetime. While the planning can already take years, involving many different stakeholders, including consortia of companies and local communities, the running of the road or airport adds an extra need for ongoing performance and usage data. Hundreds of documents – from environmental assessments to consultations – will be generated through the process (like in this example from Paraguay). With this complexity comes not only a clear need for transparency, but also structure to effectively track progress. Earlier this year the World Bank published ‘A Framework for Disclosure in Public Private Partnerships’. The framework, based on extensive research, identifies key information that should be proactively published at each stage of a PPP project, from initial planning through to project execution. 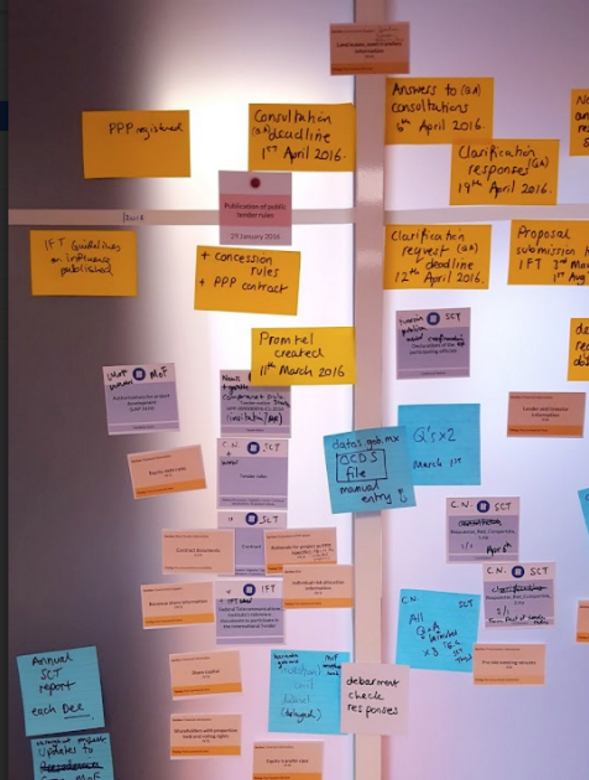 The framework answers the questions of ‘What information should PPP projects disclose?’. There are good arguments that more open data and disclosure will lead to better projects. But how that information should be disclosed is another question. In July, the World Bank’s Open Contracting Team, the Open Contracting Partnership and Open Data Services went to Mexico to explore this question. 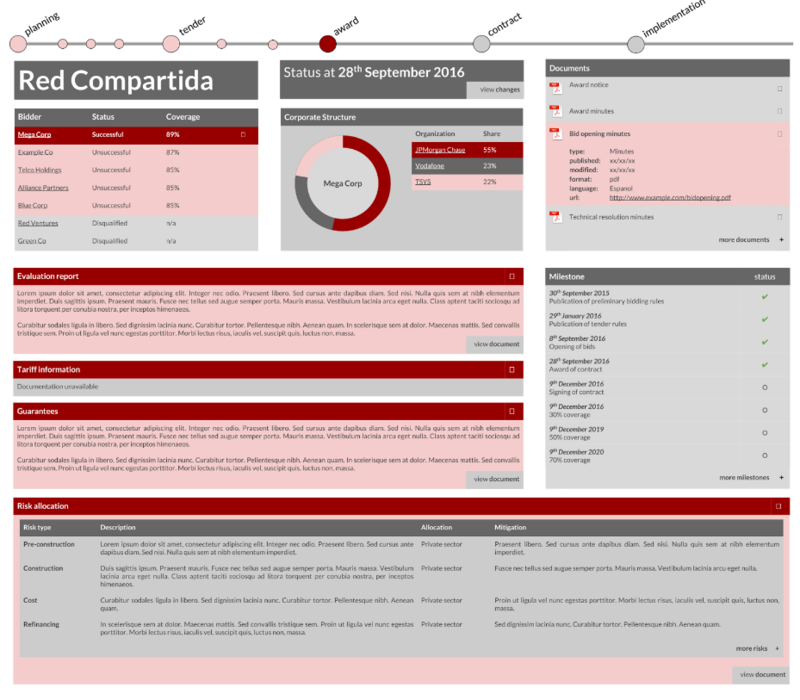 We worked with a team from the Ministry of Communications and Transport in Mexico to map out a timeline of disclosures for their Red Compartida mobile telecoms and data network PPP project to create a shared 4G telecoms network. We found a wealth of documents and data points are already being disclosed. However, the documentation made public is scattered across different government systems. Planning information, approval and proposed budget information is held in a database on Ministry of Finance Website, tender documents are in the national Compranet platform, and when the project is operational, concession agreements and performance information will live within the Federal Institute of Telecommunications website. Analysis of data across different PPPs. Mocking up visual interfaces to make PPP information accessible. As with the original development of the Open Contracting Data Standard, we’re keeping a focus on what data publishers can reasonably provide, and how this can be provided to meet user needs. You can follow the technical details of this work in the extension project’s issue tracker here, or, if you would like to find out more about this work, drop a line to data@open-contracting.org.